One of the best local meal deals around DFW is/was at the Spaghetti Warehouse on Wednesdays. You could walk in and enjoy spaghetti, a salad, and some fantastic table bread for FIVE BUCKS. Yeah. Five bucks. That is cheaper than most, if not all, combo meals at your favorite fast food joint. Again I say…FIVE BUCKS. BUT…and there is always a “but” isn’t there? 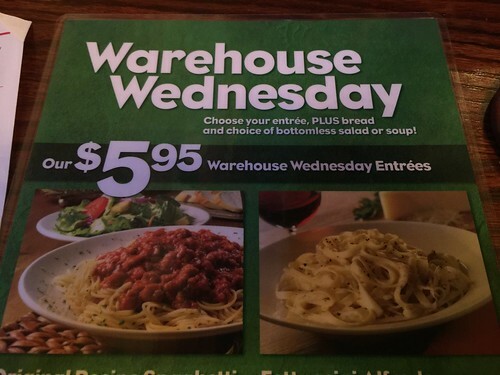 Spaghetti Warehouse has decided to raise the price to $5.95. Basically a dollar more for the same deal. Don’t get me wrong, it’s still a great deal at SIX, but I just don’t love it like I did when it was FIVE. I don’t know why. I do know that I am not alone as the location I went to was PACKED (as it usually is on Wednesday…where everyone orders the spago) and I have been told by a couple of servers that they are nervous that this is gonna backfire. That in today’s economy people might reject that drastic an increase on everyone’s favorite special. What do you think? Do you care ? Is the 95 cents no big deal?